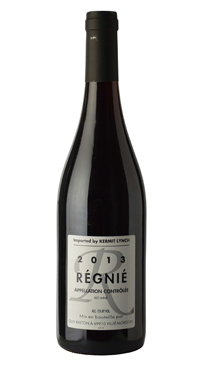 The grapes for the Régnié are sourced from the hills between the Côte de Brouilly and the Côte du Py of Morgon, around the village of Régnié-Durette. Guy’s grandfather handed down the two parcels that go into this wine: one with 100-year-old Gamay vines and the other with 35-year-old vines. The shallow soil of sand and decomposing stones gives the vines easy access to the bedrock, creating firm wines with more grip and acidity than in Morgon.